By the look of it, Google is currently running its latest PageRank Update. Seosydneyblog.com has moved from a PageRank of 0 to a PageRank of 4 and a couple of websites I manage have also seen their PageRank increase this morning. As noticed in the past, the update usually takes a couple of days to settle, so do not get too ecstatic because the PageRank scores might still change. Regarding the rankings, I have not notice many big differences as the rankings'changes usually take place over a larger period of time before and after the effective PageRank change. 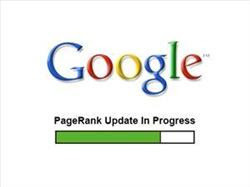 The last Google PageRank Update took place mid- January, just after one in October 2007. Based on the last three consecutive updates, I would suspect that Google actually proceed with the update every 3 to 4 months, which would bring the next one around July-August 2008. Being quite surprised by the originality of the message, I actually typed it in! With a bit of efforts, I found the Paul Strange Presents website, which is actually a club promoter in Sydney. I have found that strategy brilliant in many ways and I am quite convinced that the Paul Strange Presents website will get many hits, PR and Blog post through this strategy. However, from a search marketer's point of view, the implementation could have been even more effective. 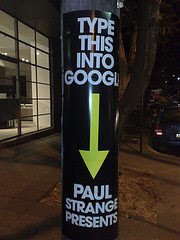 Paul Strange Presents (or their advertising agency, I am not sure) have been really innovative in their approach. It is not so common to come across businesses able to understand the power of search engines to drive online traffic from an offline media. In his presentation Willie Pang demonstrated that 26% of online users find a website from print advertising and 67% of online search are performed as a result of an exposure to offline media. He also demonstrated that people are not always able to remember or will forget an URL and therefore the potential traffic generated by offline media might never reach your website. Integrating Search engines in a offline campaign is a great to easily connect both offline and online media and make sure that potential traffic will reach your website. In that case, people have to remember only one simple phrase 'Paul Strange Presents' and that is it! Quite often a brilliant idea is not followed by a brilliant implementation. In the case of Paul Strange Presents, the search engine presence is not optimal, which might result in some users not being able to find the website. While the website ranks first on Google.com.au pages from the web (see below), the website does not rank on the first page of the SERPs when you search pages from Australia. It is little tricky especially if you are in Australia and advertise to an Australian audience. It would have been wise work on some SEO activities beforehand, to avoid this. Another thing, some sponsored links appears on the right hand side of the page. This could also be really tricky if a competitor decide to advertise in this spot. They might be able to capitalise on the print campaign to drive traffic to their website at a low cost. The Amnesia Blog suggest that a SEM (Paid Search) strategy could have been a good (but maybe expensive) to guarantee maximum placement. It is a good idea and it could actually be done in a shoestring budget as the keyword 'Paul Strange' does not have high CPC (unless a competitor decides to bid aggressively on it). What I would do is to simply contact Google, fill in the trademark registration form (It is highly likely that Paul Strange Presents is a trademark) and make sure that no other advertiser is actually able to display ads... It would not cost anything and would be quite effective to remove the competition. Finally, Paul Stranges Presents could have highly optimised their online presence in the SERPs by making sure that most of the other results are linking to their website or alternatively to display information of their website. They have done it with the MySpace page, but could have pushed this a bit further. Even better, they could have taken advantage of Universal Search. Paul Strange Presents could have easily uploaded a YouTube video with a quick preview of one of the party they organized. At the moment, the YouTube videos that appear in the SERPs are not related at all. Paul Stranges Presents could have also used Google images to display picture of the party right in the search results. Our client base is getting bigger and we need new team members! Working with industry experts within the SEO team, we will provide you with full on the job training in search engine optimisation. This position is based in our Sydney office in Cremorne. Behind every success, you will find both art and science. In marketing, the art is the idea - the message that breaks through to your audience. The science is the technology that delivers measures and serves your idea to the right people, at the right time for the most value. The Australian online retail industry has grown well in the last couple of months. Over the Christmas period, many Australian online retailers have noticed increases in traffic in excess of 30% and the outlook for 2008 are quite promising. There are many opportunities with e-commerce in Australia, but there are also some challenges including online marketing, logistics and payment systems. To answer these challenges, Stewart Carter has created the first and only online shopping conference last year. The second edition in 2008, will take place in Sydney on the 7th May. The program will have a strong focus on strategic directions in online shopping. Industry experts from all areas of online retailing will be present to discuss the challenges and best practices in the industry. It happened before and probably many people are aware of it, but some phishing emails have hit Yahoo Search Marketing and Google Adwords in US and Australia. Phishing emails or Spoofing emails aim at pretending to be an authority (Yahoo or Google) with the purpose of fraudulently collecting some private information such as passwords or credit cards details. The phishing emails targeting Yahoo Search Marketing in Australia, ask you to change your password by clicking on a link. The link actually redirects to a spoofed website that will collected your personal information. In the US, the phishing emails ask you to renew your account and inform you that your account has been suspended and will be deleted if you do not provide your credit card details. Some spoof emails targeting Google AdWords have also been received in Australia and United States using similar strategies. They ask you to update your billing information in order to re-activate your account. Some people have been caught, the lucky ones had nothing, but others lost a bit of cash. So beware of what you receive and take your time before clicking on a link. In the doubt, double check with Yahoo or Google. Aaron Wall, the author of SEO for Firefox, has recently released a new and extremely useful free SEO tool called Rank Checker. Rank Checker is a free Firefox extension that allows you to check the rankings of your website(s) in the major search engines including Google, Yahoo and Microsoft Live Search. - Rank Checker is part of Firefox, so all the data is stored on your computer. - You can select the search engines you want to check. It also allows you to check rankings for international versions of Google such Google.com.au. - You can schedule when you want to run a ranking report (daily, weekly or monthly). - You can set a delay between queries. It becomes useful if you want to avoid being blocked by Google or Yahoo (It happens more and more often!). Aaron Wall also mentioned that future improvement might include a proxy switch funtion. - You can also export data to CSV if you need to create reports. Overall, Aaron Wall did a really good job with Rank Checker. Not only did he complement his range of SEO Tools, but he also responded to a real need in the market. If you want to download Rank Checker or get more information, visit SEO Book. Australia & New Zealand SEO SEM Salary Survey: The Results! The results of the Australia & New Zealand SEO SEM Salary Survey are finally here and the findings are quite interesting. SEO Sydney Blog started the survey in February 2008 with the goal of understanding a little bit better the SEO SEM industry in Australia and New Zealand and the objective has been achieved. From February 2008 until the end of March 2008, 65 qualified SEO/SEM professionals have responded including 84.6% of individuals working in Australia or New Zealand. Before moving on to the analysis of the results, I would like to thanks everyone for their support and for their time in taking the survey. 78.1% of the SEO SEM professionals in Australia and New Zealand are male.The results also reveals that the industry is young as 64.5% of the professionals are under 30 years old and 85.5% are under 35. Interestingly, 41.9% of the respondents come from a Marketing background followed by IT and Other. Looking at the level of experience, the Australian and New Zealand SEO SEM professionals have a great level of experience. 22% of the respondents have more than 5 years experience in the industry while 54.3% have over 2 years of experience. It is interesting to notice that 37.9% of Australian and New Zealand professionals have gain their experience in 1 company and 29.3% in 2 companies. 54.4% of Australian and New Zealand professionals work for SEO SEM agencies, while 28.1% work in-house. It is interesting to notice that 17.5% of respondents work as Freelance or Consutants. Employee is the most popular position with 41.4% of the respondents while the rest of the industry is quite well balanced between freelance, manager, senior managers and owners/CEO. Salary wise, the Australian and New Zealand industry offers reasonable wages. 53.4% of the repondents are getting $60,000 or less per year including 18.2% of the professionals earning below $35,000 per year. On the other side 14.5% of the professionals earn $150,000 or more per year which makes the salary range quite diverse. If you are interested in getting more details on the results, please feel free to download our Salary Survey PDF Report.